Xiphophorus: from the Ancient Greek ξίφος (ksíphos), meaning ‘a kind of double-edged sword’, and -φóρος (-phóros), meaning ‘bearing’, in allusion to the presence of a gonopodium in males of this genus. variatus: from the Latin varius, meaning variegated, a reference to the differing colouration. Originally endemic to the Atlantic slope of Mexico but introduced or feral populations now exist in several other countries, including Costa Rica, Colombia, the USA, Hawaii, Singapore and Hong Kong. Wild fish are rare in the hobby these days, with the vast majority of the ones on sale being mass-produced in the Far East and Eastern Europe. Typically found in shallow, heavily vegetated streams, ponds, swamps, canals and ditches. It’s particularly associated with habitats where algae and other phytoplankton is present in large quantities. Male 2″ (5cm). Female 2.8″ (7cm). Not critical but this species does appreciate a planted aquarium, and will be seen at its best if kept in this type of setup. X. variatus must be maintained in moderately hard or harder water; it will not thrive in soft, acidic water. Omnivorous by nature, feeding on a variety of zoobenthos and detritus in the wild. Unfussy and will accept most foods, whether frozen, live or dried. A good fish for the general community aquarium being both peaceful and hardy. When males and females are to be housed in the same tank, there should be more females to spread out the attention of the males which can be relentless. Batches of fry will be continual. Males are smaller and possess a gonopodium. Breeding is much the same as for many other livebearers. We recommend that several females should be kept to every male in order to dissipate vigorous harassment by males. Areas of dense planting will also help. Gestation takes around 4-7 weeks and large broods of over 100 fry are not uncommon. 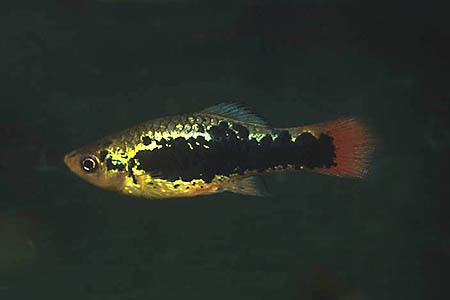 The adult fish will not eat their young but the best method of raising them is still to remove the gravid female to a separate tank and allow her to give birth there before returning her to the main aquarium. The use of breeding nets or traps is not recommended as their small size is not suitable for raising fry. The fry are quite large and will accept brine shrimp nauplii or powdered flake from birth. They grow very quickly if fed 2-3 times per day. 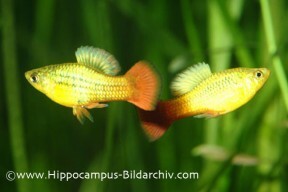 Another massively popular aquarium fish, with dozens of selectively bred varieties available. Some of these are produced by crossbreeding with X. helleri or X. maculatus. Unfortunately many commercially bred platies are not very hardy due to inbreeding and over-production and are prone to disease and premature death. The wild X. variatus can be distinguished from X. maculatus by its slimmer, more elongated body shape and slightly longer dorsal fin. This last feature has been seized upon by many breeders with some stunning high-finned varieties available. The wild form is sometimes seen in the hobby and is a very pretty fish indeed. If wild fish are obtained care must be taken to avoid crossbreeding with domestic forms. The fresh-water fishes of Mexico north of the isthmus of Tehuantepec.